This is only very partially true. Only if you use a smartphone case that does not allow the heat (generated while charging) to escape, can the handset get actually ‘overheated’ due to overnight charging. There IS, in theory, a slight ‘trickle charge’ when a phone is plugged in and has full charge (a small amount of charge decreases and is refilled constantly) – but that is, in no way, as problematic that it often is made out to be. The next time you hear about how your iPhone or Android phone can explode if you keep it charging through the night, just remember that you are no longer using the older Lithium ion batteries. As long as you are using the genuine phone charger or a similar one (and not a knocked-down, cheaper product), there is absolutely no need to worry about this. Of course, you need to make sure that there is no dampness in either the charger or the charging station (for instance, if you talk on your smartphone while having a shower, and the phone is plugged in – you are simply asking for trouble). Otherwise though, for a quick chat, using your handset while it is being charged is a safe option. Note: Do keep in mind that, the more you use your phone while charging, the longer will it take for the mobile battery to get fully charged. Oh well, they can’t. According to expert software and mobile app developers – when you download and install external ‘app-killer applications’ – all that you do in essence is block some more memory on your handset. Both Android and iPhone handsets have the capability to use resources efficiently while managing app-usage in the background. Generally, app-data is cached – so that less time and memory/battery resources are required to launch them later on. If anything, when you kill apps prematurely (“Force Stop”), you disrupt the natural flow in which RAM resources are used. On both iOS and Android, a ‘more empty’ RAM does not mean a ‘more efficient’ phone battery. Just think from the poor smartphone’s perspective for once. You use it round the clock every day – talking, checking mails, sending messages, playing games, and what not. Shouldn’t you give it little breaks from time to time? The myth that mobile batteries get damaged when a handset is turned off does not have an iota of truth in it. Provided that you are only shutting down your phone for small periods at a time, and not for days on end (which will cause the battery to depreciate) – there should be no problems whatsoever. On the contrary, the auto-brightness tweaks can really work well to give you some extra battery juice. In a recent test, it was found that when the screen brightness is reduced to the lowest possible level, the battery life of Android phones jumped by over 30%, and that of the iPhone 6S by a whopping 55%. Given that it is not always possible to keep the brightness levels so low (when the light around you is insufficient, for example), the auto-brightness feature is an excellent alternative. The screen brightness level will adjust automatically, and there will be no unnecessary wastage of battery. This is neither always possible, nor is it necessary. Unlike the old nickel cadmium batteries, Li-ion batteries can actually ‘remember’ how much the actual full-capacity level of the phone battery is. Also, the process of charging Li-ion batteries is completely different from that of nickel cadmium batteries. 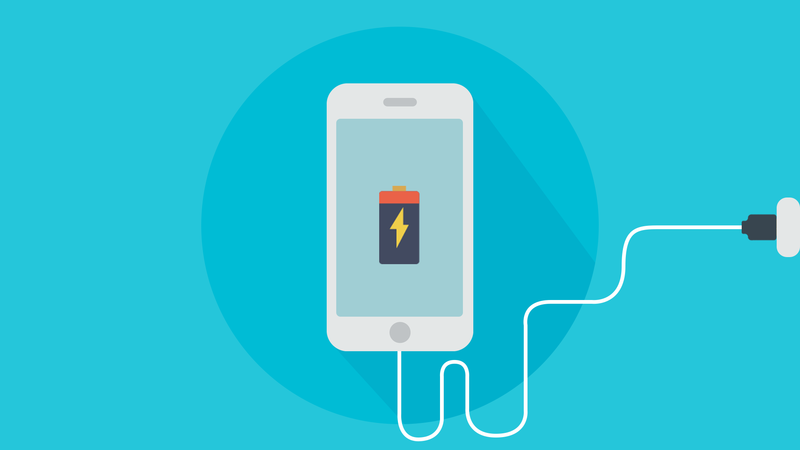 There is no need to discharge (use up, that is) the phone battery entirely – before you plug it to charge again. Ideally, your smartphone should always have 25%-40% charge. Note: Li-ion battery usage takes place from one ‘cycle’ to the next. You can exhaust 50% of the charge on one day and 50% on the next – instead of having to finish off the entire 100% at one go. In essence, you can charge your smartphone whenever you want. This is true only if you use a cheaper replacement cable that uses substandard components and/or uses the wrong electrical charge (voltage or amperage). That is one of the main reasons why device testers and Android/iPhone developers advise users to stay away from the non-branded chargers that are available aplenty in the market. If the OEM charger has become unusable due to any reason and you need to use a third-party charger, make sure that you choose a branded charger that uses the correct power measurements. There won’t be problems. Yet another partial truth. When you use your mobile browser to access web pages in general (and not watch YouTube videos or use any streaming services), that does not accelerate the battery drainage of your phone in any way. In fact, playing mobile games (particularly, the ones with high-end graphics) causes battery drainage at a much faster rate. Professionals from the domain of mobile app development confirm that graphic engines are the worst offenders – as far as quickly eating away the battery life of mobiles is concerned. You can browse the web without any concerns – it’s only when you are gaming that you might have to reach for the charger soon! That’s taking things to the extreme. There used to be a time when Bluetooth technology drew a significant amount of power to function properly. On the latest iPhones and Android phone models though, the Bluetooth feature is a lot lightweight – and toggling it from ‘on’ to ‘off’ won’t cause any noticeable difference in the battery performance. The same goes for your phone’s wireless internet services, albeit with a slight qualification: you should not keep the wifi on at places where there is very weak or low signal – since battery will go down quickly when your phone constantly searches for available network(s) to join. For GPS-based location services, ensure that only the apps that require it are using it. Avoid keeping location services on for all applications, all the time. We have already highlighted how you do not have to get your smartphone battery to 0%, before plugging it on to charge. This is an extension of that point – where we debunk the myth that phones have to be fully charged before you start using them. Nearly all new smartphones are shipped at about 50% charge – and researches have revealed that most handsets function at the most optimal level when the charge is between 45% and 85%. Instead of ‘deep-charging’ your phone every time (0% to 100%), it is a much better idea to charge it at your convenience – irrespective of what the battery level at that point in time might be. With the widespread concern over the battery life of smartphones, it is rather ironic that most users still prefer to stream music real-time on their phones (via Spotify or Apple Music). It is much more advisable to download the music first, from the same sources, and then listen to the audio files that are now stored in your device. The overall battery resources required will be way lesser, and you will enjoy music without any worries. ‘Hey Siri’ and ‘Google Now’ do take up some extra charge (on iPhones and Android phones respectively), but the amount is too small to make a difference on the overall battery performance of a device. A recent test conducted by Wirecutter and using the Nexus 6P and the iPhone 6S proves this. Developers, in general, advise against the use of Siri/Google Now only when the battery charge has already become very low. Otherwise, you can keep asking questions to your phone! Did not work in the early-90s, and will not work now either. Li-ion batteries are affected both by extreme cold and extreme heat, and putting them in a freezer will only cause further damages. If your phone battery is repeatedly getting heated up (even when you are not using the phone for long hours), you should get in touch with with a proper vendor – and get the necessary repairs/replacements done. Of course, most sophisticated smartphone models come with non-removable battery – so the question of pulling out the battery does not arise in the first place. This one is true (moisture does affect phone performance), but comes with a rather obvious connotation. If you select a phone case that practically seals off your device from all sides, the accumulated heat will not be able to escape – and that can lead to drainage of battery at higher-than-normal rates. Try to keep your phone in room temperature, away from moisture, and in an ‘open’ environment. The battery performance will be the best. Android and iPhone app developers keep reiterating the importance of checking the battery usage lists on phones. With the help of these lists, users can easily track the amount of resources that is being consumed by each app, find whether there are any buggy applications, and get rid of them (if required). Yet another common myth about smartphone batteries is that, using wifi instead of mobile data all the time helps in saving battery resources (the difference, if at all, is only around 2%). It’s high time you stopped believing myths such as these…they do not help your smartphone to ‘last longer’ in any way!